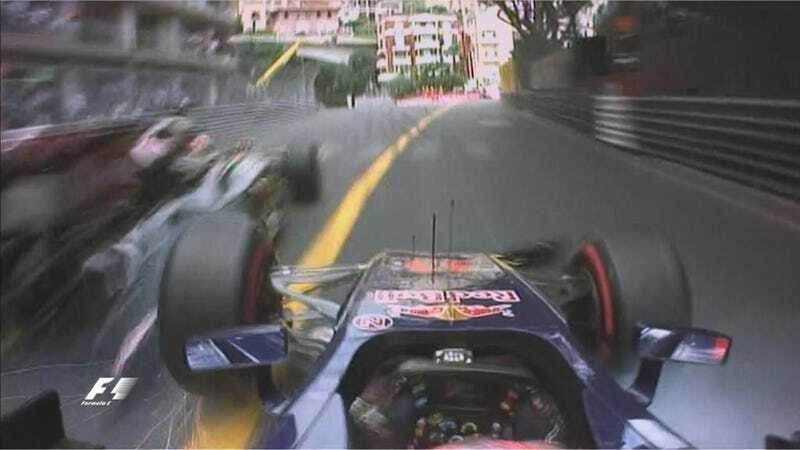 Max Verstappen caused the first safety car of the Monaco Grand Prix, hitting the barriers hard at St. Devote. He tried to make a move around the Lotus of Romain Grosjean, but ultimately clipped Grosjean’s rear, sending his Toro Rosso into the wall. Ouch! Verstappen confirmed that he was OK after the hit, however, the resulting safety car came out right as leader Lewis Hamilton pitted. Nico Rosberg and Sebastian Vettel stayed out, and Lewis Hamilton was unable to rejoin ahead of both of them, rejoining in third. It was his race to lose, and he pitted at precisely the wrong moment. Update: Verstappen told commentator Will Buxton that Grosjean braked 10 to 15 meters earlier than he did on previous laps, effectively brake-checking him before the turn. He’s unhappy and a little sore, but should be fine. Update #2: Verstappen is about to get a lot unhappier. According to Motorsport.com, the stewards have determined him to be at fault for hitting Grosjean, and have assigned him a five-place grid penalty for the next race in Canada accordingly. He was also awarded two penalty points.